Like walking on air and attractive too! Color Blue, Size 7. Extremely lightweight and flexible DBL compound. The color is consistent throughout the clogs. The back strap swivels so you can wear it up or as a traditional clog. It is washable using cool to warm water. 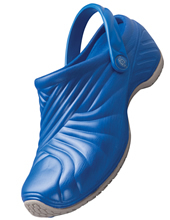 Rubber outsole is Slip Resistant and flexible. This shoe is easily washable in warm or cool water. True to size. Medium width. A DICKIES brand clog.